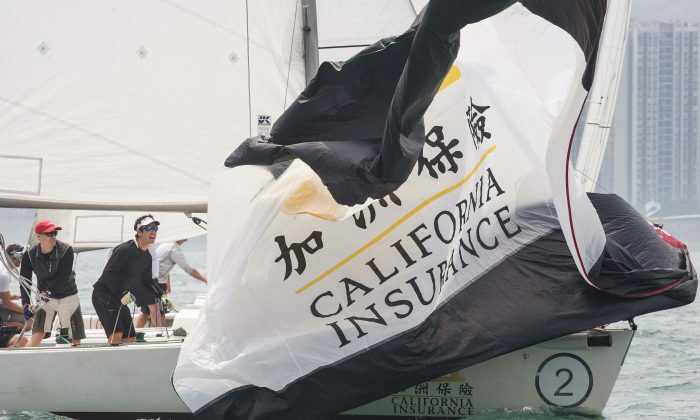 HONG KONG—The 3-day 2016 California Insurance International Match Racing Series was held in very variable wind and weather conditions in Victoria Harbour from April 22 to 24. The series was won by Singapore yachtsman Maxi So and his crew. After the first round-robin on Friday April 22 contested by 8 International teams, Ollie Pekka Lumijarvi of Finland, led the field winning 6 matches. Maxi Soh of Singapore was second with 5 wins, followed by Peter Backe (Hong Kong). Mark Lees Great Britain), Jeremy Koo (Malaysia) and Marty Kaye (Tasmania) – all of whom moved forward to the second round-robin on Saturday April 23. Finishing in 7th and 8th places, L Mead and H Matsuyama were eliminated after stage 1. In Saturday’ racing, Maxi Soh won all his races to head the table with Peter Backe 2nd, Ollie Lumijarvi 3rd and Jeremy Koo 4th – all moving on to Sunday’s Semi-finals. Racing over the first two days was disrupted by unfavourable weather with big changes in wind direction and strength making life extremely difficult for the organizing team. The fickle winds and changeable weather continued for the semi-finals on Sunday causing long delays in proceedings with only 3 flights able to race. A huge downpour in the afternoon was the final straw and all racing was abandoned. Race Officer Inge Strompf-Jepsen. described the regatta as very tough. The final results were decided from the results in the Semi-finals and looking back through the preliminary rounds. Maxi Soh was declared the winner, Ollie Pekka Lumijarvi was placed 2nd, Peter Backe 3rd and Jeremy Koo of Malaysia 4th.